We are macaroni and cheese lovers to the highest degree. My kids could eat any version of it as a side dish with everything or all on it's own as a main dish, every single day. Although I still keep the boxed stuff around from time to time, I genuinely try to make macaroni and cheese from scratch more often than not. I mean, it really is very easy to do. 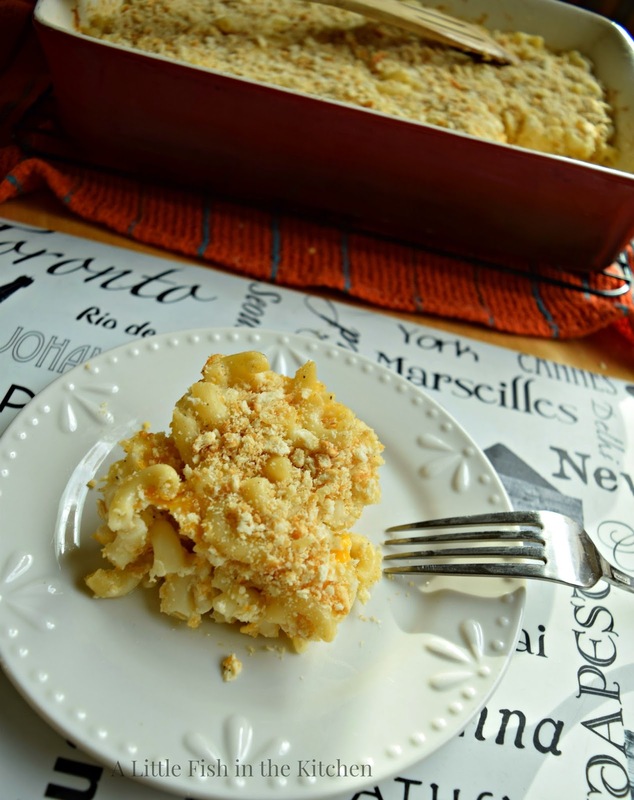 This baked macaroni and cheese is supremely rich, creamy and cheesy. I was immediately in love with it the first time I tried it at a potluck dinner several years ago. Luckily, the host was eager to share this recipe! It's made with a mixture of cottage cheese, shredded cheddar cheese and a good swirl of luscious, sour cream and baked until it's all gooey and melt-y. It's honestly become a comfort food staple in our house and it's something we all look forward to. For some reason, I only tend to make this on the weekends. 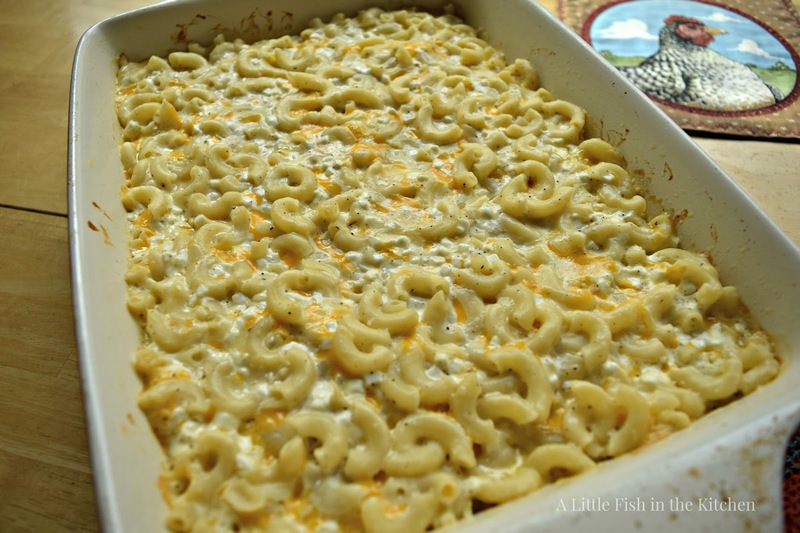 So, a distinction has been made between this recipe and any other cheesy pasta dish and it's known around here as "weekend macaroni and cheese". Now, I know a few people who won't even give cottage cheese a chance, but I promise that in this recipe, it's a really good thing. With all of it's wonderful salty-creaminess (that's a technical term), cottage cheese lends alot of flavor to this dish. To be fair to the non-fans, the cottage cheese curds do melt in this dish, but they don't always break down completely, as you can see in the picture above. If the appearance of cottage cheese bothers you, use a potato masher or a few pulses of a food processor and break it down a bit more (for a smoother cheese sauce) before you add it to cheese mixture, but don't skip it! Also, I also have thing with topping macaroni and cheese with crushed Ritz crackers. In fact, I giggled at myself when I looked at that old post and saw the cracker crumbs there... I'd forgotten I added them back then too. Crushed crackers were not mentioned anywhere in the original recipe for this baked macaroni and cheese, but of course I added them. I just like it! That's how I roll and I hope you like it too! 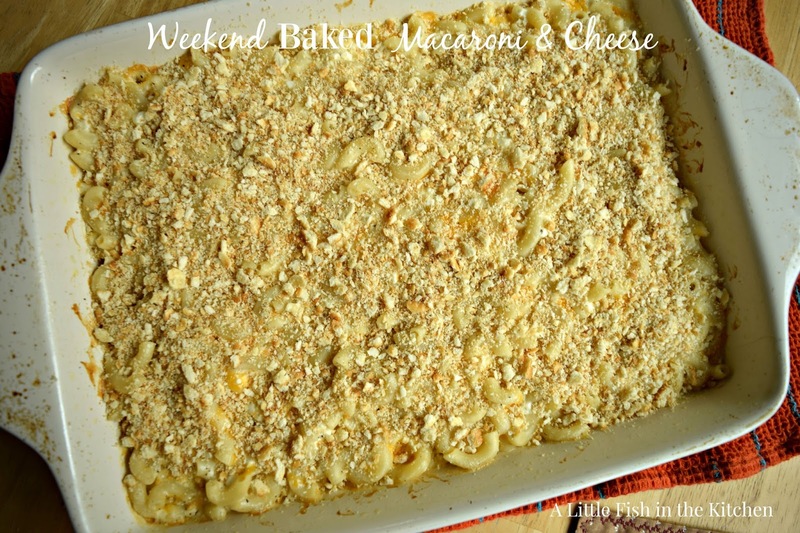 This is a wonderful, rich and creamy baked macaroni and cheese dish your family and friends are sure to love. It's a great addition to the menu for a simple family dinner or the holidays. It's a large portion that feeds a crowd or provides tasty leftovers for a few days. Pre-heat oven to 350 degrees. Place cooked, drained macaroni in large mixing bowl and set aside. In another medium bowl, mix the next 7 ingredients together (not the cracker crumbs). 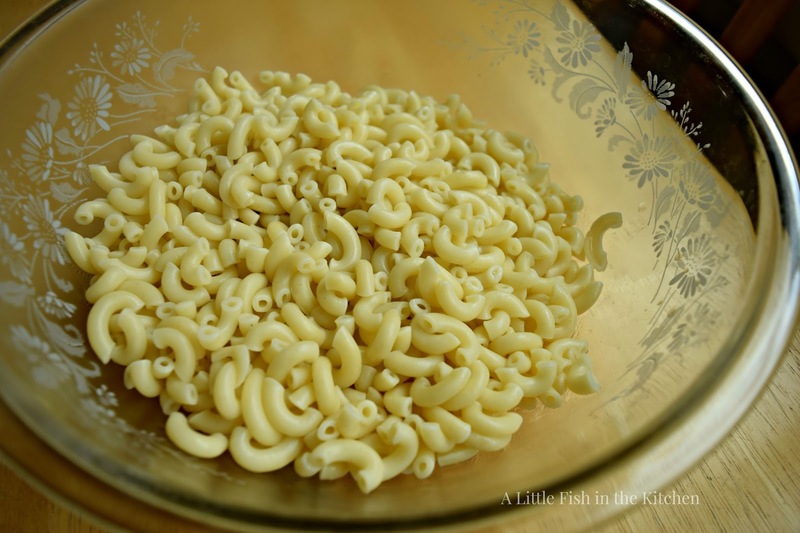 Mix the cheese mixture into the cooked macaroni. 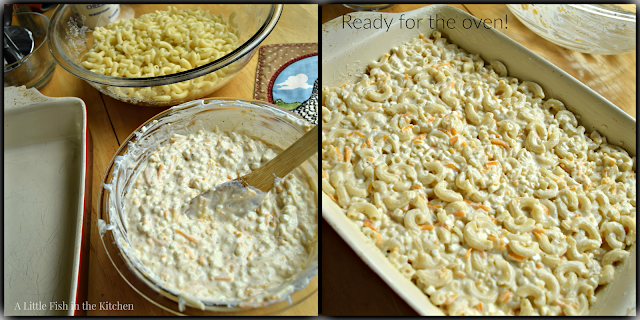 Spread the macaroni into a lightly greased 9 x 13 inch baking pan. Bake, uncovered for 25 - 30 minutes or until cheese is completely melted and the dish is heated through. Sprinkle with crushed Ritz crackers, if desired. Enjoy! Great dish Marcelle, mac and cheese is always welcomed at our house. Love that you added cottage cheese, sometimes I add that to our red pasta dishes and it is delicious. Hope you had a wonderful week-end, thanks for sharing! Hi Cheri! I hope you had a great weekend too :) Thank you so much! An ultimate comfort treat! I should make some too because I haven't had mac and cheese in a while. Oooh, this sounds wonderful, Marcelle. I've never made a mac and cheese with cottage cheese and can't wait to try it! We are big mac & cheese fans, too, and have a couple we like to make depending on how bad we want to be! I have to say that I banned the boxes - but that is easy to do when you don't have children! :-) I can't wait to try yours, Marcelle! Hi David, mac n cheese always does seem a little bit naughty, doesn't it? :) Thank you!! I have put sour cream in my mac and cheese, but never cottage cheese! 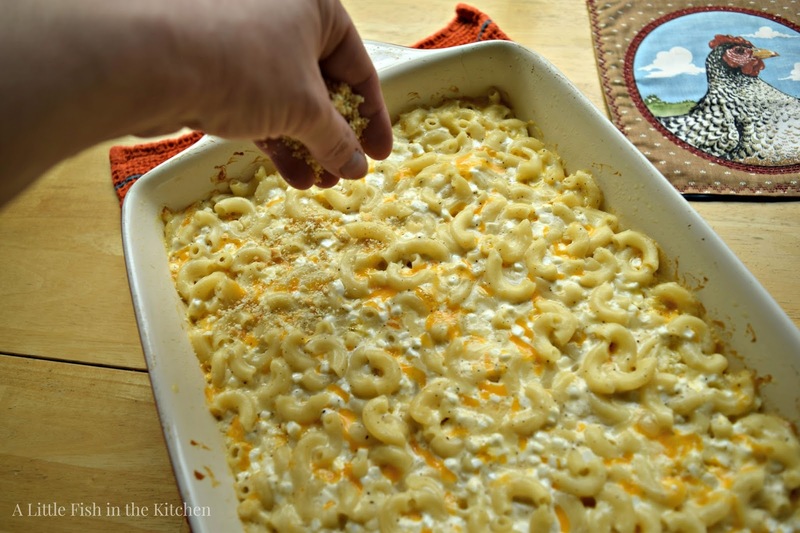 My mac and cheese loving daughter would certainly love your scrumptious looking homemade version! Thank you!!! Looks tasty with the crisp topping. YUM! Thanks for sharing this recipe. It is quite different with the addition of cottage cheese. I can't wait to try it. Thank you Marcella for sharing your recipes at Dishing It & Digging It. Enjoy your week. Cottage cheese works well in baked things, I think. It always absorbs the flavor of other ingredients, so it works really well. Anyway, this looks terrific. 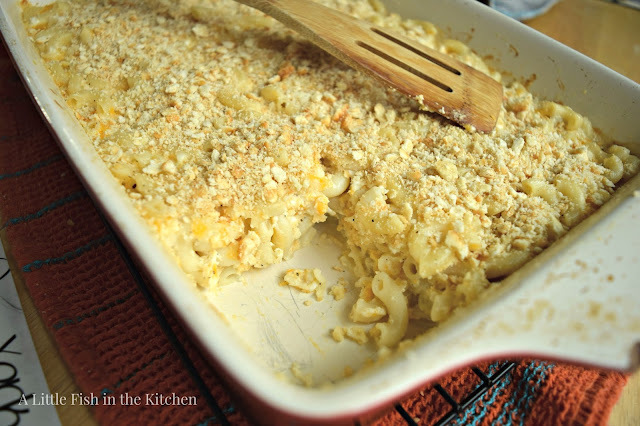 I'm not a fan of stovetop mac 'n cheese, but love the baked kind. So this is perfect for me! looks great and so prefer homemade. I can certainly see why your mac and cheese would be a weekend favorite, it sounds great. Pinned and BOY am I hungry now!